Charming yet modern, the Chateau de Langeais Treehouse combines a fairy tale form with a contemporary style, making it a rather noteworthy and interesting design. Set in the grounds of Chateau de Langeais, one of France’s oldest medieval castles in the Loire Valley, the treehouse offers visitors a unique experience. Although it was not designed and built by Blue Forest, the treehouse is featured under our popular ‘Tree House Hero’ series, providing a review of some of our favorite treehouses from around the world. 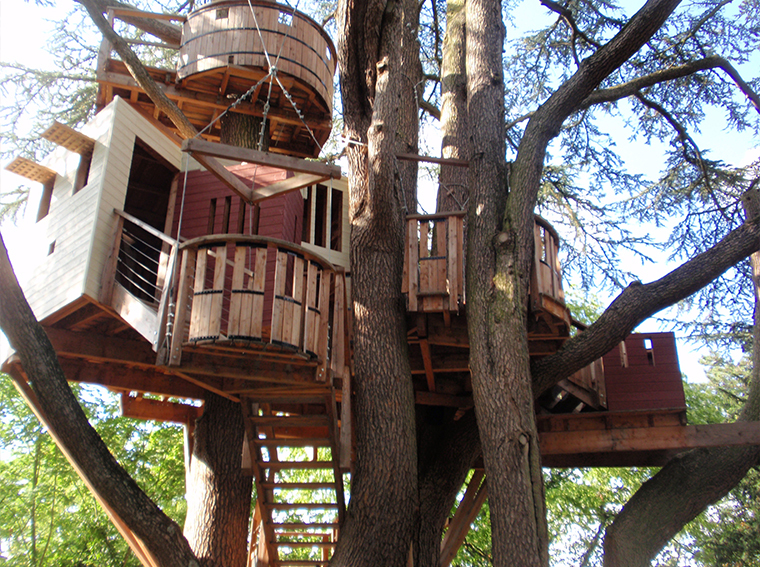 It was essential that the treehouse could be accessible to the public without requiring supervision from staff at the Chateau but at the same time, building amongst a complex cluster of smaller and larger branches meant that the design had to allow for the freedom of movement for all the branches independently of each other. As a solution to this, the treehouse consists of smaller ‘sections’ or ‘parts’ jumbled together, which gives the design a wonderful ‘nook-and-cranny’ feel. With a total of 6 different levels, the treehouse stands at an impressive 6.5 metres above the ground and promises a real sense of adventure; young visitors love exploring different passageways and discovering new hiding places as they play. Despite the mix of different shapes and forms, which usually gives a rustic fairy-tale effect, the Chateau de Langeais treehouse still maintains a fresh and smart look. The lines are straight and uniform, with minimal detailing and long lengths of Larch cladding. The windows are consistent and angular, and the look-out crow’s nests mirror each other’s curves perfectly. Most distinctly, where many treehouses are left bare and natural, this treehouse is painted; the ultramodern colour scheme of maroon and white perfectly offsets the natural hues of the surrounding trees and foliage.